Roots and Reflections | Amy Bhatt, Ph.D. The India that Sat Kapahi left in the 1950s had no private telephone companies, few phone lines in most family homes, and mailing a letter took almost three weeks from leaving the Seattle post office and arriving in Delhi. Today, India is but a Skype call or email away. Over the past six decades, South Asian migration to the Pacific Northwest has changed dramatically and the world in which immigrants live has also expanded to include new diversities and experiences. Routes and Reflections: South Asians in the Pacific Northwest is a cultural history of South Asian immigration that explores these changes by examining life stories of settlers who came to the Pacific Northwest between the 1940s and the 1990s. 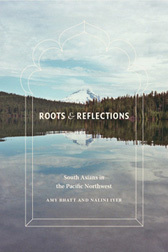 In this book, Amy Bhatt and Nalini Iyer draw on oral histories from the South Asian Oral History Project at the University of Washington Libraries, archival material, and popular culture representations to explore the various routes that brought South Asians to the Pacific Northwest, their motivations for leaving their homelands, and their experiences upon arrival. Starting with an introduction to early immigrants who were among the very first from South Asia to come to the United States between the 1890s and 1920s, this book captures the nuances and intricacies of immigrant life following the Second World War. Tackling issues like dealing cultural dislocation, adapting to new educational systems, labor markets, and regional industries, forming families, negotiating gender roles, intimate relationships and inter-generational differences, and developing new community institutions, this book uses stories to explore the local dimensions of a global phenomenon. What emerges is that the notion of the “South Asian community” is a contested one and cannot be understood either as a model minority or an exotic other, but as groups of people whose experiences are distinctly located and shaped by the Pacific Northwest. From the proliferation of bhangra-style exercise classes to dosa and chaat cafes to entire strip malls dedicated to South Asian businesses, South Asians have made an indelible impact on the suburban hills and valleys that edge the metropoles of the Pacific Northwest. This book thus contributes to migration studies and postcolonial area studies by demonstrating how regional histories are essential for complicating and deepening understandings of both regions and communities. It also speaks to debates in diaspora studies and ethnic studies by showing how South Asian American history is a history of geo-political shifts, changing boundaries, and new patterns of global movement. By situating individual stories within larger historical patterns of immigration, settlement, and community-building that cut across the Pacific Northwest and the United States at large, the life histories profiled in this book also reflect the continuities and differences across time periods that shape immigrant experiences. Bhatt and Iyer craft a narrative about diaspora, immigrant community formation, and changing regional affiliations by foregrounding the voices of individuals, but do so with critical reflection on how people actively create images of themselves, reinterpret the worlds that they have encountered, balance assimilation and cultural continuity, constantly negotiate their connections to homeland, family, and national identity—and ultimately show how despite the various routes that led them here, South Asians are very much rooted in the Pacific Northwest. Dearinger, Ryan. “Roots and Reflections: South Asians in the Pacific Northwest.” Oregon Historical Quarterly 117, no. 4 (2016): 659-660. Dziedzic, Sarah. “Roots and Reflections: South Asians in the Pacific Northwest.” Oral History Review 42, no. 1 (2015): 154-156. Sohi, Seema. “Roots and Reflections: South Asians in the Pacific Northwest.” American Historical Review 120, no. 5 (2015): 1908-1909. Macias, Jennifer. “Roots and Reflections.” Pacific Northwest Quarterly 105, no. 2 (2014): 97. Shah, Nayan. “Roots and Reflections: South Asians in the Pacific Northwest.” Western Historical Quarterly 45, no. 3 (2014): 351-352. Gerbitz, David, “Roots & Reflections: South Asians in the Pacific Northwest,” Journal of the West 52, no. 1 (2013): 78-79. Hervey, N.J. “Roots and Reflections: South Asians in the Pacific Northwest” (rated HIGHLY RECOMMENDED). CHOICE: Current Reviews for Academic Libraries 50, no. 11 (2013): 2084-2085. Khan, Shehla Aftab. “Roots and Reflections: South Asians in the Pacific Northwest.” Pakistan Journal of Women’s Studies: Alam-e-Niswan 20, no. 1 (2013): 111-114. Sarkar, Sreyoshi. “Roots and Reflections: South Asians in the Pacific Northwest.” South Asian Review 34, no. 2 (2013): 151-153. Sections of the South Asian Oral History Project were featured in an interactive exhibit at the Ellis Island National Immigration History Museum opening in July 2011. Living history, India Abroad,Nov 21, 2008. Indian Americans Write Their Own History in Seattle, India West, Jan. 23, 2009. KUOW Presents: South Asia in the Northwest, Feb 2, 2008. A librarian’s gift: Oral history project preserves memories of South Asian immigrants, UW Weekly, Nov 29, 2007.